PF Collins provides a full line of international trade and project logistics services that ensure a successful project from start to finish. Our team of customs, logistics, and immigration professionals are recognized internationally as leaders in their fields and have provided end-to-end solutions to a wide variety of clients and projects in Canada and internationally. 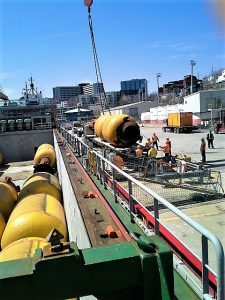 From major offshore oil and gas developments and subsea cable installations in Atlantic Canada to tanker operations in the Great Lakes and industrial and LNG Projects in British Columbia, everyday we work diligently to ensure the timely and cost-effective movement of people, materials, and equipment. For more information or assistance with your project logistics needs, contact a PF Collins location near you today!